Tristan has been teething for months now and there is still no sign of any much anticipated teeth. Constant dribbling, red rosy cheeks, unsettled sleep and chewing everything and anything he can get his little chubby hands on is the ‘norm’ now and I like to give him a variety of different teethers to try and help his discomfort and satisfy his need to munch on things. When MAM offered one of their new teethers for Tristan to test I jumped at the chance of giving him a new teether to chew on. Tristan loves his MAM soothers and teethers so I hoped he would love their new teether too. We were sent their Phase 2 Bite and Relax Mini teether which is designed for back teeth and suitable for little ones 4+months. Like MAM’s other products this teether is BPA free. I was instantly intrigued by this little blue teether as it is unlike other teethers I have seen, I love the shape and how there are different textures on the teether to provide relief. The quality and design of this teether is of a high standard and I think the design is very original and contemporary. for your little one to chew on and get relief. This teether comes in a handy travel box that also doubles as a steriliser. It is simple and very quick to sterilise using the box. To sterilise you simply fill the box up to the line (25ml) with clean water, pop the teether into the box, microwave for 3 minutes and then leave to cool down. Not only is this sterlising box great as it means you can have a clean, sterile teether very quickly but it also means you don't have to use a big steriliser which is especially useful when going away or when visiting friends and family and you need to steriliser the teether. Having a little box for this teether that is multi-functional (steriliser and travel box in one) makes life easier for busy parents. As soon as I gave this teether to Tristan he instantly put it in his mouth and started chewing on it. He loves chewing on it and the different textures satisfy his need to chew whilst providing instant relief. The teether is small and lightweight, because of this and its unique shape he can hold the teether with ease. As MAM say, this teether is ‘perfect for little hands’. This teether is designed for back teeth and the design allows him to easily reach the back gums without problems. After months and months of teething no teeth have appeared yet, as such Tristan’s front gums bother him a lot and even though this teether is designed for back teeth he happily bites down at the front with it too. I like how the original design means that it prevents baby from putting the teether too far into their mouth. As this teether is small and lightweight I think it would have been perfect for when he started teething months ago when the started suffering early as other teethers were too big for his little mouth and too heavy for him to hold easily. It is a perfect size to pop in the changing bag without taking up too much room so that we have the teether to hand when out and about and Tristan needs to chew on something. However as it doesn’t come with a clip I have to keep an eye on it when out and about so that we don’t loose it if Tristan throws or drops it; but I’m sure a clip could easily be attached if I wanted to add one for safe keeping. I would recommend this teether to any parent whose little one is teething. I am very impressed with the innovative shape and design of the teether which provides relief for my little man’s discomfort from teething and I love how it is truly perfect for tiny hands. YAY!! I love my new teether!! The Phase 2 Bite and Relax teether (4+months) is available to buy on the MAM online shop for £4.00 and comes in a choice of 3 colours; Blue, Pink and Green. They also make a Phase 1 Bite and Relax teether which is designed for front teeth and suitable for use from 2+ months of age; this teether can also be purchased on their online shop for £4.00 and comes in the 3 colours. The teethers will soon be available to buy in stores too. 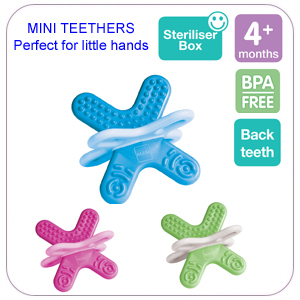 I think the teether is great value for money especially as it comes with its very own steriliser box. All of MAM’s products can be purchased on their website and join the MAM Club to receive news on special promotions, competitions and new products. You can also keep up-to-date with MAM by following them on twitter @MAMBABYUK and joining them on their facebook page.